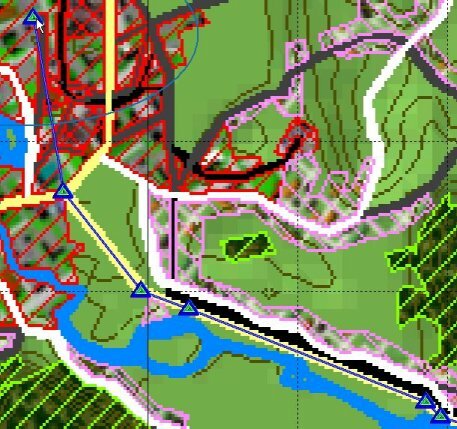 The first step in creating an enemy battle plan to challenge the player is planning paths for enemy units. 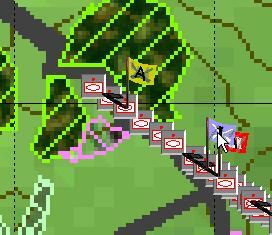 Obviously, if the enemy is defending in the scenario, you need only place the units and plan the commitment of a reserve. But in our example, to make things interesting, we will have the enemy attack to destroy the defending player. Planning a path for an enemy unit or hierarchy is almost the same as doing so for friendly units and hierarchies, except that all 'stop' nodes have 'cancel times', at time at which they revert to 'go' nodes. This allows you to create a kind of 'poor man's AI' if you do not want to script a simple move. 1. Select 'Show Path' either from the toolbar or the 'Edit' menu. 2. Select a unit or hierarchy by double-clicking on it. 3. Plan the path for the unit or hierarchy. To add a node, left-click on the last node in the path and, while holding down the left mouse button, drag to the next node location. Release the button to 'drop' a node. 4. To change a node to/from a 'stop' node, right-click on it. When a node is changed to a 'stop' node, you will be prompted to input an elapsed time when it will revert to a 'go' node. If you don't want it to change, enter a really high number in the 'hours' block such as 999. 5. 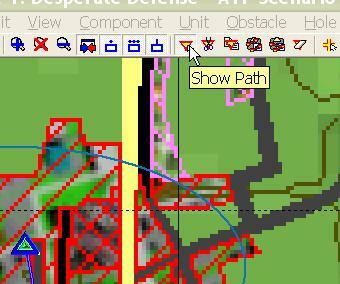 Select 'Show Path' from the toolbar or 'Edit' menu again to cancel path planning.